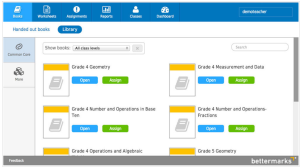 Online math platform bettermarks is looking for teachers to test its new Common Core adaptive math books. The company is offering five to 10 teachers unlimited access to the bettermarks platform to use in all of their classes for a full school year. All other applicants can request an extended demo account for one class. Interested teachers should e-mail Anne Smith with your name, the name and address of your school and the number of math classes that you would like to have licenses for. bettermarks offers more than 30 adaptive math books aligned to the Common Core standards. The books contain interactive exercises with explanations for fourth through twelfth grades. All books are available in both English and Spanish. The bettermarks platform guides each student individually and gives feedback based on responses that the student has entered. Students always get a second try to solve problems, so they can apply the feedback directly.